The Urban Detox Concept uses all the properties of the Ozone Sauna and Rectal Insufflation. In doing so the concept combines them into a single ozone treatment. By combining the two methods it further enhances the cleansing process. Thereby increasing the breakdown of non-specific toxins in the body.The Urban Detox Concept works by applying precise amounts of medical ozone gas. While at the same time using specific concentrations for each of the applications. Therefore, the combined ozone treatments result in a breakdown of non-specific toxins. This reaction also causes a wide range of free radicals to be released into the blood. Furthermore, the combined treatments also increases the body's capacity to neutralise the harmful effects of free radicals released. This is how medical ozone can protect our body from oxidative stress. As a result the combined treatments produces a powerful cleansing detox while supporting the whole body. This significantly reduces the majority of all detox reactions when compared with a traditional detox. The Urban Detox Concept also provides additional flexibility when it comes to nutrition, food planning and supplement support. This means that you don't have to use strict diets to perform a deep detox. This is great news for all clients living in London. Urban Detox maintains the highest professional standards for client safety. Urban Detox uses good practice guidelines in the delivering ozone therapy. We only use medical ozone gas when applying our ozone treatments. Practitioners who offer ozone therapy and use an oxygen concentrator as there source to produce ozone. Fall below the best practice guidelines. Oxygen concentrators produce a type of ozone that is of very low grade. This types of low grade ozone is not suitable for therapeutic purposes. Low grade ozone falls below the safety guidelines and standards of good practice to deliver ozone therapy. By using medical ozone gas we comply to all health and safety regulations. This ensures we can deliver and perform ozone therapy safely and effectively. Urban Detox practitioners are assessed and assured by the Ozone Society the first regulatory body for the practice of Medical Ozone in the UK. 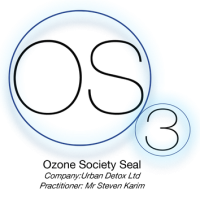 Urban Detox is endorsed by the Ozone Society and has been given the Ozone Society Seal.